Commonly known as “root canals,” Endodontics is the dental specialty concerned with treating infected nerve tissue of teeth. Root canals are usually performed as a result of extensive decay, tooth damage or trauma to the teeth which results in an infection of the pulp. The root canal process includes disinfecting and reshaping the pulp chamber to treat the infection. What most people don’t realize is that with the advances in dental technology today, root canals are actually quite painless. 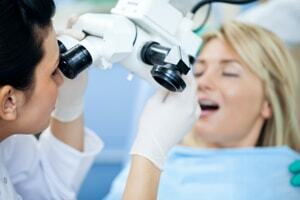 Having a root canal is no more invasive than a routine filling or crown. The dentists at Downtown Dental want you to receive the best care possible. In order to achieve this, the dentist will evaluate whether your root canal can be completed in our office or if you would benefit from seeing one of our specially trained endodontic colleagues in Charlottesville, who may use high-resolution medical microscopes and imaging technology.